On this date curious people would wait up on the 24th of April, St. Mark’s Eve to see who would die in the Parish. The details varied a little according to location, but the basic idea was that you sat in a church porch and the spirits or wraiths of those who were to die that year ahead would be seen as ghosts. The watchers had to remain silent from when the church clock struck 11pm until the clock struck one, and a procession of the dead predicted that year would appear either leaving or entering the church. In some places such as Yorkshire, the observer would have to be there for three days in a row and then only would be able to see it. 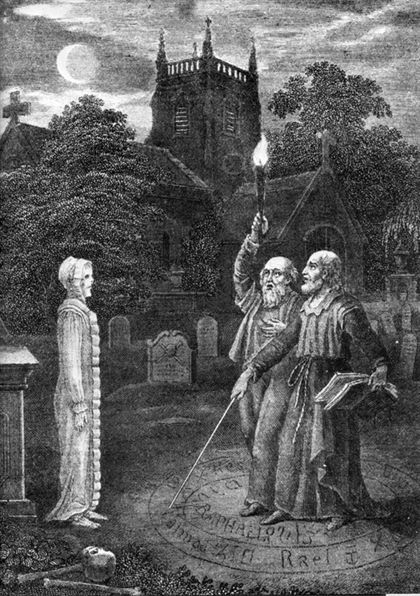 “In the year 1631, two men (inhabitants of Burton) agreed betwixt themselves upon St. Mark’s eve at night to watch in the churchyard at Burton, to try whether or no (according to the ordinary belief amongst the common people) they should see the Spectra, or Phantasma of those persons which should die in that parish the year following. To this intent, having first performed the usual ceremonies and superstitions, late in the night, the moon shining then very bright, they repaired to the church porch, and there seated themselves, continuing there till near twelve of the clock. About which time (growing weary with expectation and partly with fear) they resolved to depart, but were held fast by a kind of insensible violence, not being able to move a foot. About midnight, upon a sudden (as if the moon had been eclipsed), they were environed with a black darkness; immediately after, a kind of light, as if it had been a resultancy from torches. Then appears, coming towards the church porch, the minister of the place, with a book in his hand, and after him one in a winding-sheet, whom they both knew to resemble one of their neighbours. The church doors immediately fly open, and through pass the apparitions, and then the doors clap to again. Then they seem to hear a muttering, as if it were the burial service, with a rattling of bones and noise of earth, as in the filling up of a grave. Suddenly a still silence, and immediately after the apparition of the curate again, with another of their neighbours following in a winding-sheet, and so a third, fourth, and fifth, every one attended with the same circumstances as the first. These all having passed away, there ensued a serenity of the sky, the moon shining bright, as at the first; they themselves being restored to their former liberty to walk away, which they did sufficiently affrighted. The next day they kept within doors, and met not together, being both of them exceedingly ill, by reason of the affrightment which had terrified them the night before. Then they conferred their notes, and both of them could very well remember the circumstances of every passage. Three of the apparitions they well knew to resemble three of their neighbours; but the fourth (which seemed an infant), and the fifth (like an old man), they could not conceive any resemblance of. After this they confidently reported to every one what they had done and seen; and in order designed to death those three of their neighbours, which came to pass accordingly. The tradition appears to have died out by the 1800s across the country as rational thought sadly took over. However, there was at least one survival into the 20th century in Oxfordshire as a report in the Oxford Times recorded the event in the north of the county. So next St Mark’s eve perhaps…or perhaps not…you’ll want to watch.